Baseball's bigwigs are meeting Thursday in the latest episode of the Expos' relocation soap opera. They may finally announce that the team is moving to Washington, D.C., but with litigation now being threatened, there's a decent chance that the 'spos might play yet another season in Montreal. That'd be good news not only for the team's 13 fans (OK, maybe 19 now that the NHL season is on hold), but also for Tim Raines, Gary Carter, Andre Dawson, and Rusty Staub. They're the four Expos who've had their numbers retired, an honor that will be lost in the ether when the franchise eventually moves and, presumably, changes its name. Here's the deal: Teams that have retained their names when moving to new cities, like the Dodgers and Braves, have kept their retired numbers out of circulation. But teams that have changed identities upon relocating, such as the St. Louis Browns, the original Washington Senators, and the reincarnated expansion Senators (who are now the Baltimore Orioles, the Minnesota Twins, and the Texas Rangers, don'tcha know), all started with clean numerical slates. The relocated and renamed Expos will likely start from scratch as well. Kinda makes you wonder what they told Raines when they retired his number this past June: "Tim, we hope you'll feel proud to know you can always look out there and see your number enshrined on the outfield wall -- at least for another few months." Retired numbers, of course, couldn't exist until the advent of uniform numbers themselves. Although the Yankees are often credited with the invention of uni numbers, it was actually the Indians who first wore digits -- on an experimental basis in 1916 and permanently in 1929. What the Yanks can legitimately lay claim to is the first retired number: Lou Gehrig's No. 4, in 1939. The Bombers have subsequently put 14 more numbers on the shelf, more than any other team. The Dodgers are second with 10 (for a complete team-by-team listing, scroll down to the bottom of this page). By coincidence, the Yankees are the only team that hasn't yet retired No. 42, which all other teams have mothballed in honor of Jackie Robinson. 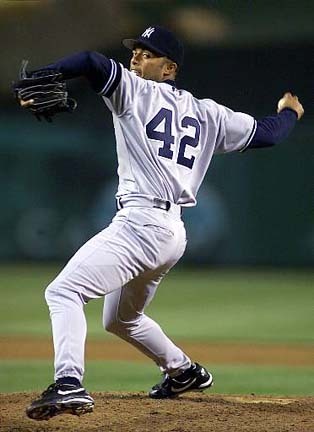 The Yanks will do likewise with the eventual retirement of Mariano Rivera, the last of the grandfathered players who were already wearing 42 when the number was declared sacrosanct in 1997. Robinson notwithstanding, baseball's king of of the retired number is Nolan Ryan, who's received the treatment from three different teams. His No. 30 was retired by the Angels, with his No. 34 declared off-limits by the Astros and Rangers. 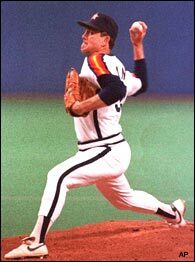 Nolan Ryan's number was retired by the Astros, and two other teams. Frank Robinson: No. 20, retired by the Reds and Orioles. Rod Carew: No. 29, retired by the Twins and Angels. Casey Stengel: No. 37, retired by the Mets and Yankees, making him the only two-time managerial honoree. Rollie Fingers: No. 34, retired by the A's and Brewers. Hank Aaron: No. 44, retired by the Braves and Brewers. Reggie Jackson: No. 9, retired by the A's, and No. 44, by the Yankees. Carlton Fisk: No. 27, retired by the Red Sox, and No. 72, by the White Sox. Conversely, two teams have retired a single number for two different players: the Yankees (No. 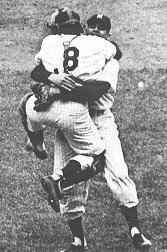 8, for Yogi Berra and Bill Dickey) and the Expos (No. 10, for Dawson and Staub , at least for now). 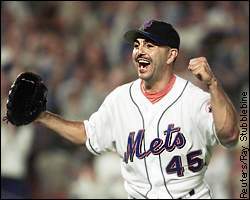 A trickier situation is brewing for the Mets, whose longtime reliever John Franco wore No. 31 for more than eight seasons. But when the Mets acquired Mike Piazza, who'd worn 31 with the Dodgers, Franco gave the number to Piazza and switched to No. 45 as a tribute to former Mets sparkplug Tug McGraw. Uni Watch expects the team will one day honor all three players simultaneously by retiring the two shared numbers (assuming the entire Mets franchise doesn't spontaneously combust before then -- a distinct possibility, given the way things have been going). Several teams have also retired a number for someone who never even wore a uniform. Uni Watch takes a dim view of this mini-trend, which began in 1982 when the Angels retired No. 26 in honor of owner Gene Autry because he was the team's "26th man." Two years later, the Cardinals saluted team owner August A. Busch, Jr., by retiring No. 85 on his 85th birthday. Then there are the Marlins, who retired No. 5 before the franchise had even played its first game. This was in honor of team executive Carl Barger, whose favorite player was Joe DiMaggio. And speaking of uni-related honors for non-players: Uni Watch was curious to see how the Mets would memorialize their Hall of Fame broadcaster Bob Murphy, who died last month. Putting Murphy's initials on a sleeve patch, as the Cardinals did for Jack Buck, wouldn't do (think about Murphy's initials for a moment and you'll see why). And unlike Cubs broadcaster Harry Caray, who was eulogized with a caricature sleeve patch, Murphy didn't have a particularly distinctive visage. So the Mets took a more direct route: They simply embroidered Murphy's name onto their left sleeve (using white lettering for their black jerseys). Amidst all the remembrance armbands and patches that have been used over the years (you can find a historical breakdown by scrolling down to the middle of this page), Uni Watch believes this is the first time someone has been memorialized via his full name. It's such a beautifully simple approach, whoever thought of it should have his number retired. Minutiae obsessive Paul Lukas writes about the details of food, business history, design, and pop culture. He has never had his number retired. Archives of his pre-Page 2 "Uni Watch" columns are available here and here. Got a uni-related question or comment for him? Send it here.